Some of the most popular dog food storage options are cabinets and cabinets with feeding stations, which combine the usefulness of storage with the necessity of finding a place to keep your dog’s food and water bowls. Wooden dog food cabinets are especially popular due to the appearance of the wood, the longevity of the material, as well as the reasonable prices that come with using wooden material. 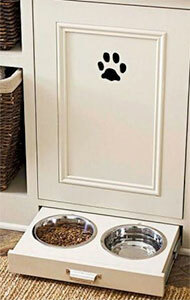 If you are looking for the very best of stylish wood dog food cabinets, consider the following ten great options! The white painted appearance gives it a modern look which will be especially appealing for dog owners with more modern home design styles. APetProject’s large storage and feeding station combination features a sleek, simple design that combines an elevated feeding platform with simple storage. 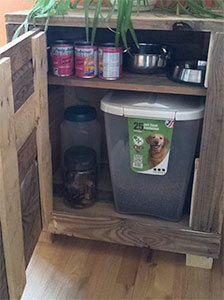 The top of the feeding station lifts up to reveal a compartment for storing food, toys, or other dog related supplies. Due to the lifting top, you will need to empty or remove the food and water bowls before accessing your storage. This option is best if you are looking for a no-frills feeding station with a storage compartment. 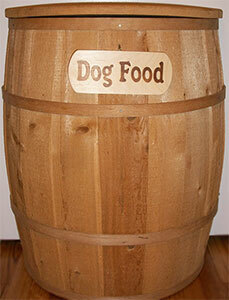 This simple dog food container is made out of unstained natural cedar, and is large enough to hold up to 40 pounds of dog food. It does not contain a feeding station, hooks or additional accessories, but it is perfect for completing the simple task of storing your dog food. This barrel has a rustic look that is perfect for anyone who lovers rustic, shabby chic, and retro home styles. This storage cabinet from HomeAXCESS is made from real wood and features three different types of storage: a pull-out drawer with two bowls for food and water, a pull-out storage cabinet for storing food, and a shelf for storing other items. 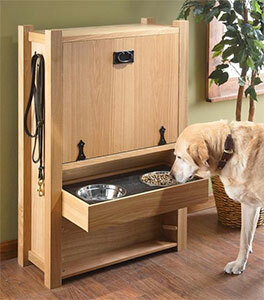 The cabinet also features two handles on the side for storing leashes and collars. It has a simple but pleasing look which will fit in with most home design styles. This food station is ideal if you’re looking to save space in your home. 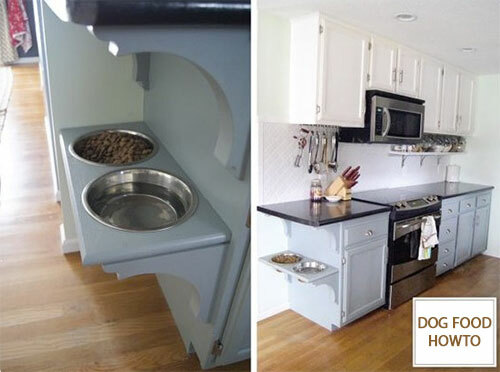 The mounted pet food station fits right in with your kitchen cabinets and other kitchen furniture, and does not take up any significant room in your kitchen. It does not provide any built-in storage however, so you will need to store your food separately from the feeding station. 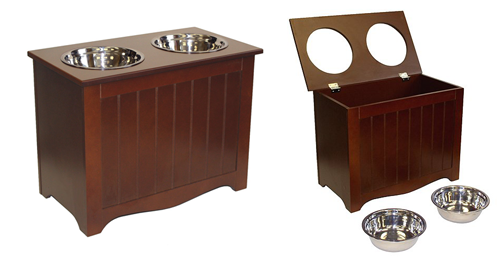 This stylish feeding station comes complete with three different storage options to help you save space and make feeding your dog easier than ever before. 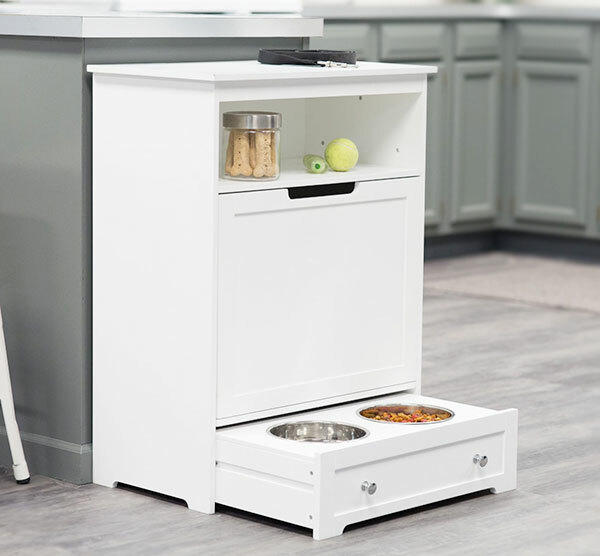 This feeding station features a pull out drawer with two feeding bowls, a central storage cabinet for storing your dog’s food safely, and a shelf for additional storage of your dog’s treats, toys, leashes, and anything else that might fit. 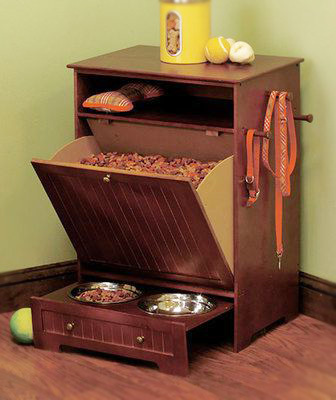 If you’re looking for a simple, aesthetically pleasing dog food cabinet, look no further than this basic cabinet that offers you plenty of storage space. You will be able to easily store your dog’s food, treats, toys, bowls, and anything else you might need to keep hidden away in a stylish cabinet. You will need to store your dog’s food in its original bag or an airtight compartment, however, because the cabinet doesn’t offer a built-in airtight compartment. 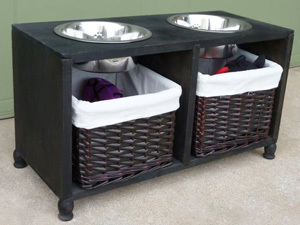 This unique and very stylish dog feeder combines a charming look with a practical storage option and built-in feeding bowls. Designed to look like an old luggage drink, this storage and feeding station features metal finishing, bowls that are built-in to the top of the “trunk,” and a large wooden compartment which is perfect for storing food, treats, and everything in between. 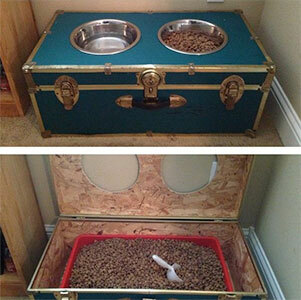 You will need to get an additional container to hold your dog’s food in the compartment because it is not airtight. Sometimes, simple is best! This very simple storage compartment and feeding station combination features two built-in bowls on top and two open-faced compartments on the bottom. You will need to find an airtight container to store your food in if you want to store food on one of these compartments. Otherwise, they are perfect for storing other dog related items, such as your dog’s favorite treats, their collar, leash, dog shampoo, toys and more. This adjustable storage cabinet combines a sleek and professional look with all of the features you need from a combination storage cabinet and dog feeding station. It features a raised feeding station with two removable bowls which are mounted on a tray, along with an extra-large storage compartment which pulls down and out from the top. In addition to the storage compartment, the cabinet features hooks for storing leashes and collars. This design is especially appealing to modern homeowners due to the larger size and finished wood.